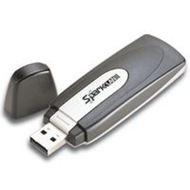 SparkLAN WL-685R Wireless 11g Compact USB Adapter gives you instant connection to the available wireless networks. For the size of your thumb, WL-685R operates under 802.11g and provides you fast data transmission up to 54Mbps, 64/128-bits WEP and WPA. Easy installation following the Quick Installation Guide included in the package.